With 3 reels, and 1 pay line. You can bet a maximum of 3 coins, with the coin value set at $1.00. 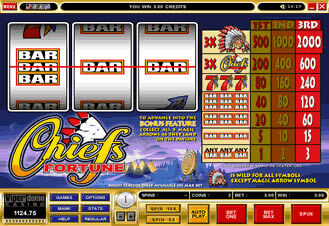 The highest jackpot that you can win here is 2,000 coins. The Chief symbol is the wild symbol. Being able to complete a winning combination for every symbol except that of the Magic Arrow. Don't miss out on the excitement to play the bonus screen where you can win up to another $1,000. This is one game where you WILL want to place the maximum bet, just for the excitement of the second screen. Good Luck.